Bolivian Games. Bolivian Traditions. Bolivian Sports and Recreation. The beauty of traditional Bolivian games, almost all of which were inherited from the Spanish, is that these forms of recreation put the strength, skills and physical abilities of the male participants to the test, something that was very necessary in the past, and even more for life in the country. Regrettably, these games have been gradually abandoned and forgotten as they are replaced by video games and other modern forms of entertainment, and now are can be seen mostly during festivals and tradition days only. This is played by drawing squares on the ground with chalk: seven squares, one for each day of the week. After this each player tosses a stone or another small object into the Monday square and hops into it on one foot. Then someone else tosses a stone into the Tuesday, Wednesday, Thursday squares, and so on until reaching Sunday where the stone is kicked out because the game has finished. Players can only hop on one foot and have to hop into the square where their stone landed, otherwise they are disqualified. In non-Andean Bolivian they call this game ‘Rayuela’ and there are two versions of it: for girls and for boys, with variations in the number of squares, their names, and the objects they throw into the squares. It’s very similar to hopscotch. ‘Carretilla’ means “wheelbarrow”. This is played with four people, in two pairs. Each par must get into a “wheelbarrow” positions: one with his or her hands on the ground and feet up behind which the other holds their friend’s feet like the handles of a wheelbarrow. The two pairs race across the lawn, as if one were pushing the other like a wheelbarrow and whoever gets to the end first wins. This is a hand-held toy and one of the most popular Bolivian games, especially in rural areas. It’s a small toy that consists of a wooden ball that has a hole in it and is tied with a string to a hand-held piece of wood that has a stick in it. You throw the ball up into the air with a throwing motion and since it’s tied to a string, it returns toward you. As it’s returning you have to try to catch the ball in such a way that the hole in the ball fits onto the stick. Today there is another more commercial version of this toy that looks more like a wooden wine glass. The ball must fall into the ‘cup’ instead of fitting onto a slender stick, so it’s easier. ‘Sortija’ means ‘ring’ in Spanish. This is played while riding horse in a field and requires a good eye and great aim. A cord is strung across the field between two poles or two houses at about the height of the heads of the riders and a disk of about 15 cm diameter is strung through the cord. Usually it’s made of tin and it has a hole in the center. Players must gallop from one end of the field toward the disk with a short pointed stick in their hands and when they get near the disk they must try to put the stick into the small hole. If they do it, they get a price but if they fail the next rider gets a chance. This game is played until all prizes have been awarded. Bolivian games like these were brought over by the Spanish. Before they arrived, there were no horses in South America. ‘Trompo’ means ‘top’ in Spanish. There are many Bolivian games involving these wooden tops that have a metal point and a string that winds around the top. These kinds of tops are made to spin by jerking on the string that is wrapped around them sort of like a yoyo only the string isn't permanently attached. Players draw a large circle on the ground with chalk and each player must spin their top inside the circle. The idea is to ensure the top spins longer than any other player’s top and as it spins it will hopefully bump the other player’s tops, either making them stop spinning, or bumping them out of the circle. Players even slide their hands under the tops as they are spinning and they continue spinning on their hands. They then re-drop the top into the circle near an opponent’s top, hoping to knock the other player’s top out of the circle. The last top spinning is the winner. ‘Palo ensebao’ (correctly spelled ensebado) means ‘greased pole’ in Spanish. This is one of the funniest Bolivian games and is played by standing a tall thick pole in the ground (about 8 meters high) and greasing it with wax or grease. A prize is placed at the top of the pole before it’s greased. Each player must attempt to clime the pole using only their hands and feet. They cannot wear shoes or gloves or any other item that would help them climb. This is a game of resistance and agility and the pole is very slippery. Most players aren’t able to climb it. The first to make it to the top gets the prize. This is played in many countries around the world. This is another game that requires strength and is typical to Eastern Bolivia. It consists of drawing a line on the ground. Two players, each on one side of the line, get down on hands and knees and turn their backs to each other. A single rope is tied around their each of their necks so they are actually tied together. Remaining always on their hands and knees, each player must strain forward in the opposite direction of the other. Each player is attempting to pull the other player toward the line. The player that achieves this and gets the other player to fall over the line is the winner. ‘Pejichi’ comes from the local Santa Cruz word for armadillo (peji), the animal that inspired this game, I have no idea why. Today players usually tie the rope around their chest or around one of their legs so it’s safer. There are two variations of this Bolivian game, one on horseback and one on foot. In both a previously sacrificed goat is used. Ropes are tied around its back and front legs. When played on horseback, the goat is set on the ground and riders must ride very quickly toward it and attempt to scoop it up from the ground by one of the ropes. They then gallop toward the finish line while other riders attempt to take it away from them. If another rider is able to grab the goat away from the one who picked it up, that rider must head toward the finish line. The person who makes it to the finish line with the goat is the winner. When played on foot, two players each grab the goat, one by the front legs and one by the back legs and they pull against each other until one loses grip and the other is the winner. ‘Sack hop’. This is a funny game played in many parts of the world. Players step into large burlap sacks and hop like frogs to a finish line. The person who hops to the finish line first wins. ‘Horse racing’. This is very popular during rural festivals in the Chaco region and the Eastern plains of Bolivia. Two riders race as fast as possible toward a finish line and the winner is the one whose horse crosses the finish line first. It’s not timed and it’s not by distance, it’s simply who reaches the finish line first. This is a hilarious game based on catching participants by surprise. A sort of large bug is built in the shape of a turtle shell, simulating a monster from a local fable with a really big open mouth. Inside this costume are two people one with honey and one with chicken feathers. Outside there is a group of people who move the large bug from side to side looking for “victims”. If they catch a person, they stick them into the big bug mouth and the two people inside the costume cover them in honey and feathers. The ‘monster’ then spits the person out, all covered in honey and feathers. Sometimes the person has been stripped naked too! A ‘taba’ is the knee bone of a pack animal, usually a donkey. A large round mud pit is made and players take turns throwing the knee bone across the mud. Points are given according to the design the bone makes as it skips over, or slides along the mud. The more distance it covers, the more complicated the design, and the more points that are given. It’s sort of like when you skip a stone over water. This game was introduced by the Spanish during the conquest. In Argentina, it’s very popular. They have a whole Taba Association with tournaments and championships. This Bolivian game is mean. Pato enterrado means ‘buried duck’. A duck is buried in the sand with only its head sticking out. Players are blindfolded and given a club (one by one, they take turns), then spun around and around until they are dizzy and disoriented. The objective is for the dizzy player to find the duck and club it in the head. If a player swings and misses, the next player has a turn. The player that swings and hits the duck is the winner. Sometimes instead of a duck a chicken is used. This is a dice game. Players use five die and a cup (usually made of leather) and take turns shaking the dice inside the cup. Each player throws the dice onto a table trying to get the highest score. Sometimes it is played just for points and sometimes players must form straights, full houses, etc. with the dice. This is probably the most popular Bolivian game ever and is played by all social strata and throughout the entire country. There are even cacho championships. There are also some regional variations to the game. Two Canadians marketed this game as the now very popular "Yahtzee". ‘Juego del pato’ means ‘duck game’. This Bolivian game is typical in the Chaco region and is played on horseback. It is similar to polo only the players use a ball that is wrapped in wire to make it easier to handle and they don’t use sticks, the use their hands. There are two teams, each with ten jockeys, and each team must work together to move the ball toward the other team’s goal line. It’s sort of like American football on horseback. It’s called the ‘duck game’ because long ago it was played with a live duck instead of a ball. This is a game of marbles, which are either made of glass or of wood. A 30-centimeter circle is drawn in the dirt and a player throws 5 marbles into the circle. A player picks up one of the marbles and throws it up into the air, and then while it is in the air, he or she swats the marble with the palm of the hand and with the same hand picks up the next marble. And before the first marble hits the ground the player has to catch it. It’s sort of like playing “jacks” but with marbles instead of a ball and jacks. The game increases in difficulty by adding other elements: for example, sometimes players must throw a marble into the air, pick up another marble, and turn around once before catching the marble that is falling back to the ground. 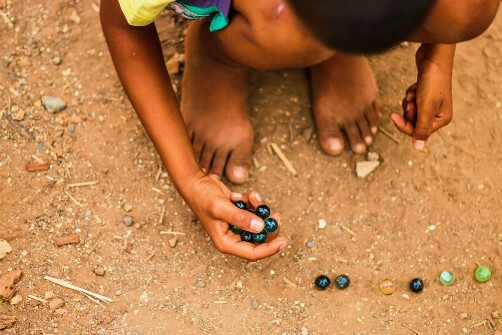 These are some of the typical games that have been played in Bolivia for centuries and some of these traditions are being forgotten and replaced by modern video and electronic games. Also, there are many other Bolivia games that are not just Bolivian such as chess, board games like Monopoly, etc.